Osama bin Laden changed my life. On September 11, 2001, my day began as any other ordinary, calm, quiet morning on a military outpost in the high Mojave Desert. I was headed to my company area for a routine early morning workout. Only this day would be different. On my way to work, the first thing I heard on the radio was that American Airline Flight 11 had crashed into the north World Trade Center tower. By the time I arrived, United Airlines Flight 175 had crashed into the south World Trade Center tower. My country was under attack. Most generations have one day in their collective memory when each person recalls what they were doing at that precise moment in history. For my grandparents, that day was Pearl Harbor. For my parents, it was John F. Kennedy’s assassination. For my generation, it was September 11th. I was then a twenty-five-year-old lieutenant assigned to an armored cavalry regiment, whose primary mission as part of the Army’s Opposing Forces was to train 5,000-soldier Army brigades for war. Our purpose at the National Training Center was to defeat a visiting United States Army unit in simulated combat and to expose its weaknesses to help it improve before it faced a live enemy. On September 11, speculation was rampant about what would come next. Soldiers’ wives were calling the company headquarters in a panic. Were their husbands going to be deployed? How was America’s inevitable response going to affect our unit? How long would this war last? One colonel speculated that the President would send the entire 18th Airborne Corps to Afghanistan. Another captain lamented that young soldiers who had joined the Army for educational benefits would soon be facing battle-hardened Afghans who had felled a global superpower. The future was uncertain. Almost immediately, soldiers were assigned on roving patrols to protect the installation and augment the military police. Within days, several mid-level officers with strategic planning experience left my unit to develop future military contingency operations. When one officer returned shortly after Operation Anaconda, the mission to destroy al Qaeda and Taliban forces in the Shah-i-Kot Valley, concluded in late March 2002, he told the Regiment’s officers to expect eight to ten years of military operations throughout Central Asia, the Middle East, and the Horn of Africa. Within weeks, one unit from the Regiment was assigned as a quick reaction force for future attacks on Los Angeles. The memory of those hectic times will stay with me for the rest of my life. So will the legacy of those attacks. The timing of my first-born daughter’s conception was heavily influenced by my and my wife’s fear that I might not survive the tumult of the war ahead. Many of my friends spent the best years of their lives fighting against a nihilistic enemy bent on their destruction. Some never made it back. Bin Laden’s death will hopefully close this sordid chapter of American history. 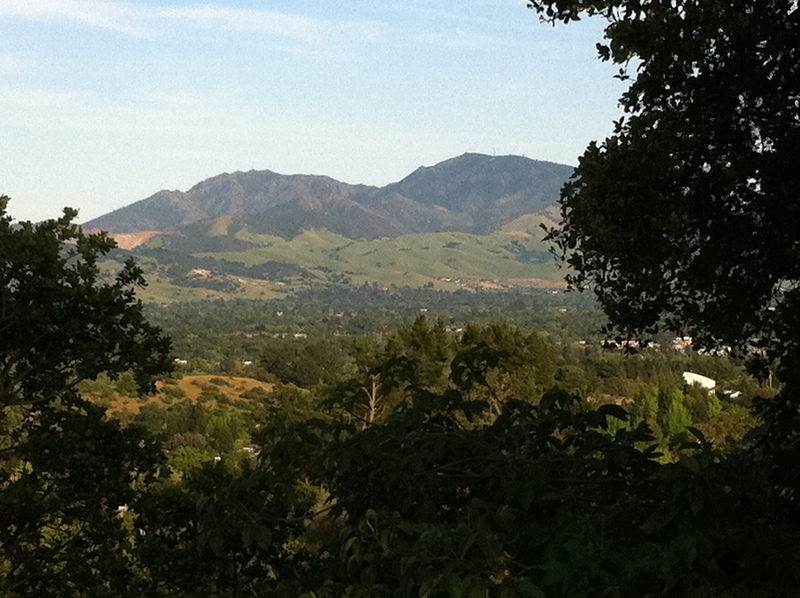 The picture above will serve as my memory of that cathartic day, when before the President announced bin Laden’s death, I found solace in nature’s majesty as I walked in the park near my home and under the shadow of Mount Diablo. This entry was posted in Central Asia, Defense, Energy Security, International Security, Media, Middle East, Terrorism, War and tagged 9/11, Osama bin Laden, Osama bin Laden death. Bookmark the permalink. Thanks to all those who have served. America did change that Tuesday morning and over the nearly 10 years that have followed. While OBL’s end is a step forward I fear this road has a long way to be traveled. True, but I feel it is not the beginning of the beginning, nor the end of the beginning, but the beginning of the end. Bin Laden’s death will hopefully close this sordid chapter of American history. Good post. I’m curious what you mean by “sordid chapter” though? the wars? the fear? the torture? all of the above? Do you really think this will be the end of the “war on terror”? It is not the end of the war on terror, but I think it is the beginning of the end. By “sordid chapter,” I mean everything that followed 9/11 including the fear, the tough wars against a stateless enemy, accusations of torture by the left against the right, accusations of lack of patriotism by the right against the left, endless war, etc. The question now is: how does the Arab Spring affect us? My opinion is that it will hurt us. There was a New York Times article out last week suggesting that the Saudis are terrified by it and have initiated a counterrevoluation of their own. We will get early signs of it in late summer when the Egyptian elections begin. Early indications suggest that the Muslim Brotherhood is likely to do well. Not a good sign. I agree with your fears about where the movement will go. I certainly think it would be a mistake to stand foresquare with the dictators though. I think we’ve done that a lot for its being expedient in the short run, but its had long run costs. I’d like to think you can do well by doing good sometimes. The odd thing is that the only place where democracy seems to be working is Iraq. This, of course, is counterintuitive because we brought democracy by force rather than any bottoms up movement from the population. I agree that it is tough to stand by the dictators. Unfortunately, they are the ones with the most oil.